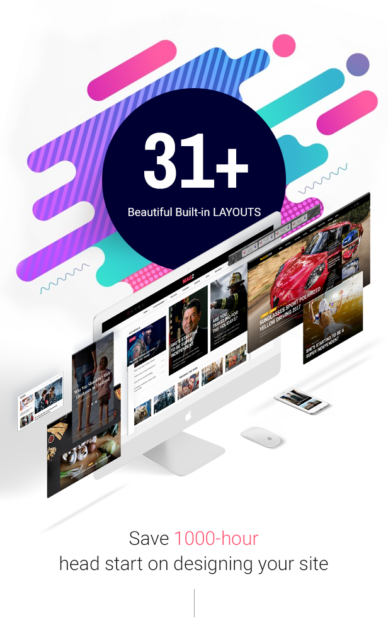 Magazette is a Creative professional multipurpose WordPress theme for magazines, news, blogs and newspaper websites. Used by Pro bloggers to promote contents, rank high in Google and also get your readers stay in your site, reduce bounce rate. Gives total freedom and power in creating your own magazine website with Drag & Drop ability, one click installer, auto update and 6 months of support. Magazette covers many demos for many purposes, many niches like fashion, lifestyle, travel, food, car, sport, beauty blog, ecommerce, education, school, college, university, training, mentor, gallery, portfolio, showcase, photography, corporate, business, construction, movie, consultant, finance, design, jewelry, charity, football, basketball, baseball, fanclub, business, industry, motor, car, travel, transport, supermarket, retail, music, cafe, journey, cinema, mall, fitness, gym, job, restaurant, hotel, newspaper enfold, bridge, avada, X theme responsive, multi-purpose, vlog, video blog, livestream, food, WPML, gem, architect, blog, magazine. Normally, a blog WordPress themeâ€™s layout is fixed and, you might lose tons of time and money developing a blog as your wish if what you wanted is lacks from the original design. However, that is none of the matter anymore since Magazette uses a collection of 95+ beautiful prebuilt easily customizables & draggable UI elements, which allows you to create any news, magazines or WordPress blog website with endless possibilities. Using this Magazine WordPress Theme, building a new Blog website is as easy as 1,2, 3. How to start an online blog using Magazette? Just simple as that, youâ€™ve created your perfect beautiful online blog. Magazette is probably the sweetest best investment for your project not only for its variety of options, range of functionalities and powerful but also for the opportunity that you can build any web blog with Magazette. Just by buying this theme, you will be opening a great opportunity for your project. With 8+ demos to import, beautiful sliders, all-form grids and block, MailChimp, WooCommerce, Contact Form 7, Instagram Feed, AdRotate, VisualComposer, and more, Magspaper will bring you the most convenience in a Magazine Newspaper Blog WP Theme. And donâ€™t forget ThimPress is always here for you, we have the best customer support team ready at your service. Below is the list of demos that you can build easily in one click with Magazette and while other magazine & blog WordPress themes cannot offer this great range of design and possibilities. Besides, if you want to build a magazine that is not presented in this list, just choose a demo that has the most similar in layout that you wanted and change the images. Or you could also build your own design with our highly customized Visual Composer WPBakery Pagebuilder with its wide range of UI elements. Magazette main demo is the best newspaper theme demo for the publishing, blogging & newspaper industry and the most innovative news theme of all time, suitable for technology magazines, news, and more. This main newspaper demo is an excellent choice for any news, magazine, blog and review website. It is designed in a way that brings more readers to read sub-pages, article pages and raise your visitorsâ€™ time-on-site. Besides, Magazette features not only stories but also videos, photos to give your site a sense of dynamic and flexibility. Working perfectly on all device, very mobile friendly and also is retina-ready, Magazette really outstandingly meets current web publishing industryâ€™s expectation and even bring it to a new height. Travel Blogâ€™s layout & styles were designed with a traveling mindset, featuring high DPI travel photos, colorful HQ videos and the memo of your journey in the most impressive and mind-blowing way possible. 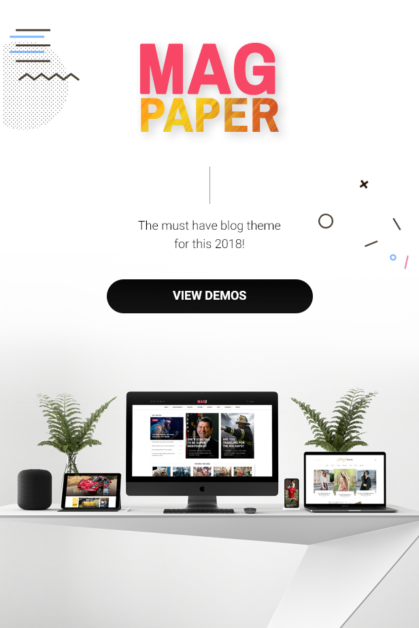 Whether you are a solo-blogger, a freelancer, a digital media agency, a magazine or just a regular person, you would still find this theme suitable for you. With TravelBlog, everyday is a new, fresh and enjoyable journey. More importantly, TravelBlogâ€™s creative and beautiful style encourage visitors to spend more time on your blog enjoying your latest adventures. LifestyleBlog is a clean, minimal & resourceful WordPress magazine theme demo. Its built to help you tell great & visually appealing stories. It is a fast performing demo and stuffed with tons of great features that make lifestyle blogging easier than ever before. If blogging and crafting new posts, articles is your hobby and you want to do it frequently then surely lifestyle blog demo magazine WordPress theme will serve your needs perfectly. Demo FashionBlog is a WordPress theme designed for fashion & beauty bloggers, especially for fashion.From Beauty to fashion and everything in between, FashionBlog brings visually beautiful and unique stylish-focused designs that pleased the eyes of even the strictest critics. Once you buy Magazette, you will also get FashionBlog & 9 other demos and be able to freely tell your own stories, craft your product-review website with your own imagination. If fashion blog is not enough to show off your creative feminine characteristic, then Beauty Blog is definitely your greatest ally. BeautyBlog is a beauty WordPress theme demo, designed for beauty bloggers, beauty salon businesses, wedding companies or it could also work well for you if you are a beautiful lady. BeautyBlog aims to provide you with everything you need while trying to be as simple and minimal as possible. On the otherÂ hand, Beauty Blog is a powerful beauty WordPress theme inside, it is also a beautiful web blog on the outside, trying to promote its ownerâ€™s characteristics. Foody is a demo Food & Restaurant WordPress theme specialized in high-quality food, dining, restaurant & service blog especially elegant modern restaurant and pub, cafes. With Foody, you will find tons of great features & designs that are built with bon appetit in mind to display your most delicious dishes in an appealing modern look. Dilly dilly! The purpose of Foody is to be a clean looking web blog, restaurant website to make clients focus on the dining experience. CarBlog is a modern high-quality demo WordPress theme custom-built for cars and vehicles of all kinds. The Carblog demo has a highly amazing design to showcase motors, automobiles, cars and beautiful models. Moreover, CarBlog allows you to boost your brand by giving you unlimited options on font, color, sidebar, menu and shortcode layouts. In general, the idea is to make your blog highly visually engaging with full of content and data about cars so that your visitors will love visiting your brandâ€™s website. Also, the demo focus on dealership, selling and it can be used for any other type of products like motorbikes, computers, electronic equipments, etc. Just install the demo, add the content, change the image and you will have your dealership blog that youâ€™ve always wanted. 9. Personal Blog, Technology Magazine, Review Website or any other magazine demo. With Magazette, there is no limit. The complete list of what kind of online news, magazine & blogs you could build can go on forever. This is the GRAND theme of Magazine & Newspaper WordPress theme. With more than a hundred of draggable UI elements, article shortcodes of many shapes, sizes and plenty of options to enable or disable things easier, you will have the ultimate power in customizing your blog into anything you wanted. Building your own blog, newspaper or magazine website with your own design is very simple with Magazette. Just choose the layout you wanted, drag and drop it into your page and change its option or styles according to your wishes. 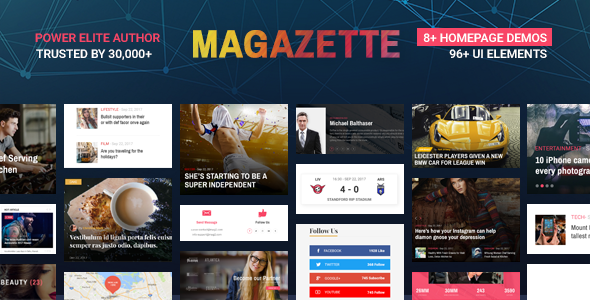 One of the most famous page builders for WordPress Visual Composer is coming along with Magazette. A Premium plugin that helps you drag, drop, create, insert, order, insert contents and build your page in the easiest way. You can also live edit your page without going to Edit Page. Not only itâ€™s free, integrated inside Magazette but also, it has been customized by us. It has the name of WPBakery Page Builder. This never-before-revealed function is a gigantic renovation which gives you all-formed grids, multi-sized blocks, beautiful sliders and more. This customization is exclusive to ThimPressâ€™s themes that not available at anywhere else. 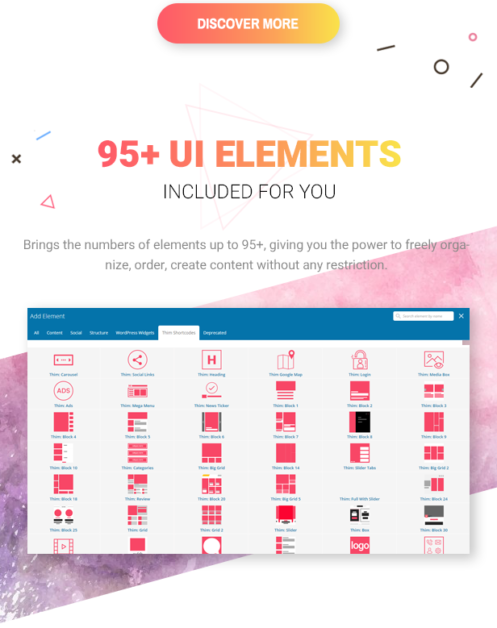 It brings the numbers of elements up to 95+, giving you the power to freely organize, order, create content without any restriction. Check out our blog demo to unveil the secret. If you really care about the flexible, that how deep you could customize the theme to be at most beautiful, then Magazette has everything you need for it. We not only integrate Magazette with advanced customize settings, but also make it easy for everyone could use them. Do you ever think complex things are only for the Pro? Not anymore. Furthermore, Magazette supports WPBakery Visual Composer with a massive number of elements to organize, powerful widgets with shortcodes at anywhere of the site, and Live Editor for you to observe your results immediately without spamming Preview Change button. With Magazetteâ€™s customization, nothing is impossible. You can customize every single area of the site with Magazette: Header, footer, body, left sideÂ menu, sidebar, contents with 200+ options and setting. Magazette also provides user-friendly User Interface that helps user easier to recognize the options and organize their sites. Be rest assured, you have our words. Hot trend block and trending news grid, etc. With Magazette, you will have the ultimate customization control all over your site. And above all, itâ€™s beautiful. Come check at our demos and witness its grandeur. Are you looking for the creative from every aspect of your site? You might want a particular design for each blog post? Then Magazette will give you multiple ones! We created various of posts with different layouts in the demos, so you can pick one of them to make it your own. Magazette also provides 8 distinctive header styles, 8+ top sliders, sidebar sliders and more than 95 customizable elements, depending on your desire and match with the siteâ€™s purpose. With those combinations, they will unleash your infinite creativity and imagination. Your images and contents will be fascinating and fantastic! Still not enough? Then you can tweak them all. You guys may be the best designers on the planet and definitely better than us, so pick up your theme and start creating your miracle. Drop Down menus with column layout have befriended us for a long long time. They have become outdated and could not keep up the pace anymore. We present you Megamenu, the next gen of menu builder and customizer. This is the real thing, trusted by 150.000+ users all over the world with more than 100.000 active installs. The Professionals are likely to use Megamenu over the old Drop Down builder. While Drop Down menu builds menus only in listing form with multiple columns, mere text lists with no additional contents, Megamenu can insert images, photos, post preview and more, making your site look nicer. This again expands your control over your site and creativity, you will have the better way to promote your post, introduce more about your contents and emphasis your siteâ€™s subject. Floating ads, slide-in bar, banner and modal pop up. Furthermore, we made a guide here for you to add ads inside post content, come check it out!Â Increase your site traffics and gain your gigantic revenue with the ultimate SEO of Magazette. As a Power Elite Author of Envato, We ThimPress always deliver the perfect products to our clients and strive to make it lasts. 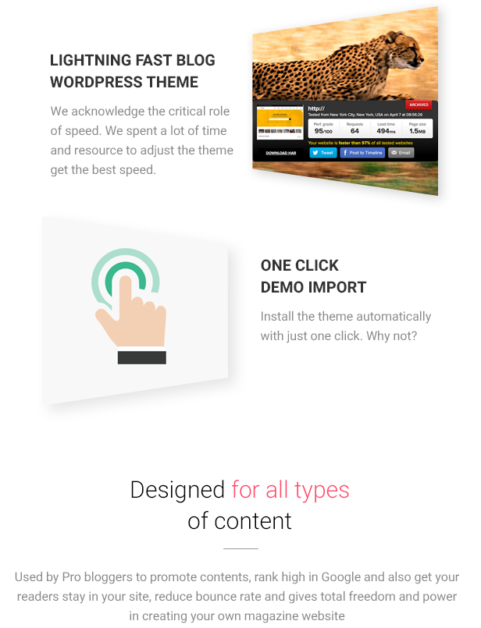 With all the great features and supports, we want to make our customers satisfied and comfortable with our themes. The performance has been proved by over 100.000+ trusted users over the world and hundreds of 5-star ratings. We also put up regular sales off and discount for our products. Save your efforts and money with us, donâ€™t miss out this chance! Magazette provides 8+ beautiful demos, which perfectly designed and carefully optimized for a magazine site. Hence, the demos will save you a lot of time and money with pre-made materials and frames. More Demos incoming, and they are always ready for you with a full feature designed. How about the importation? No more XML file, no more adjustments and handy works, MagazetteÂ got you covered. With only one click, you will have your site magically built up and decorated just as the demo. Feel free to take a coffee in the meantime as your site is about to become magnificent! We acknowledge the critical role of speed, therefore we have been spending a lot of time and resource to adjust, tweak and customize the theme to achieve the highest speed possible. Each image, each request and query is balanced optimized for performance and quality, giving you the fastest most beautiful Magazine Newspaper Blog WP site. Magazette calculates the image compression perfectly for your site and automatically optimized when inserting media. It also adjusts the order of site loading to maximize the performance, which means the higher priority contents and medias would be loaded first hand. The results will reach beyond your imagination, Magazette is one of the fastest Magazine WP Theme ever created. Smart, fast and easy, Magazette was made to be on top ranks. The theme supports awesome SEO optimized infrastructure, boosting your site and giving your site the opportunity to surpass all rivals. Therefore, every title, header and meta tags are adjusted to be easier recognized by Google or any other Search Engine. So, they can read your site faster, likely to put your site on the top of the search results. Moreover, Magazette is compatible with the famous SEO Yoast plugin, drawing more and more visitors from Google, Bing and Yahoo, increasing your traffic to the roof. In addition, it also helps you create suitable and SEO optimized contents for your Magazine WP Site. Letâ€™s boost your SEO and stay awesome. With the development of mobile is faster every day, people are likely to use their smartphone anywhere, anytime. Itâ€™s great to have a website that runs smoothly on mobile that you can access it easily. Thus, thatâ€™s why we created the responsive layout for Magazette. Magazette fits beautifully on every device, every mobile and browser. It adapts perfectly and always presents full potential on all sizes of screens. Moreover, Magazette also integrated Retina-Ready feature, which makes your site look nicer on Retina display. Your users will have the best visiting experience with Magazette. Generally, news and mags always travel faster with social media, and staying connected to the community will bring you the hottest news in return. Thus, Magazette has its exclusive elements that automatically fetch and display the latest feed from most of the social media, keeping you updated with the world. It also integrates with sharing buttons, users are easier to share your blog, post and news to anywhere on the social media. Furthermore, people can find your Facebook page, Twitter, Instagram faster with Social linking buttons on your site. All in one place, Magazette bring you the greatest social support. Having operated for 10 years in WordPress and web design business, we are aware of the importance of after-sale service. It has become the motivation for us to strive forward. Your business growth is also our growth. We ThimPress always want to ensure our customers are satisfied and eager to receive feedbacks to improve our products to meets all demands. Therefore, we deployed an impressive great After-Sale service, including Product update, Qualified Customer support service and Detailed Documentations. Save your time with our great customer support! Once you buy Magazette, you will have the license for life, unlimited use forever. Of course, the updates are free too. In general, we also push up update patch regularly, keeping the theme always up to the pace. We consistently update the theme to make sure it works with the latest trend. Your theme and your site will always be the best with no recurring fees. Moreover, Magazette comes with auto update feature. With the latest version of ThimCore, you donâ€™t have to worry about the time to check for updates anymore. It has been automated already, making things easier for both of us. We have formed a Five-Star professional customer service team, ready at your service. With a special exclusive dedicated support forum, the team is able to help you out anytime you have an issue and needed support. Please donâ€™t hesitate to create a support topic here on our support forum. Our supporters will be more than happy to help you out in within 24 hours of a business day. Trusted by over 100.000+ users and served thousands of cases and tickets every month, the team works at 200% harder to solve all the problem and brings the best experience to clients. Once you chose our theme, be rest assured because we are always here for you. We guarantee the quality of our product and try us best to keep it so. Not only the quality of the products, but also the support service that matters, ThimPress always get your back. 8+ homepage demos include one-click importer.